Fermentation is the process of turning grape or other fruits into a very pleasant alcoholic beverage. During fermentation, the little yeastie beasties dine on the fruit sugars and belch out ethanol and carbon dioxide. Temperature, oxygen and length of fermentation are the important factors in finished wines as well as the type of fermentation vessels used. Various fermentations contribute varied flavors and components to the finished wine. The type of vessel used also puts its own unique stamp on a wine. Stainless steel tanks, common for whites, emphasize fruitiness; wooden barrels are porous, concentrate a wine and pick up flavors from the wood; and secondary fermentation in the bottle is essential for those tiny bubbles. And then there are vessels made of concrete. Unknown to me until the early ’80s, concrete fermentation tanks have been around for a couple of centuries. While touring the original historic Chateau Ste. Michelle facility at Grandview, I was awestruck by the large square concrete vats sunk into the ground that were used in the early days of Chateau Ste Michelle. The railings surrounding them provided winemakers some measure of safety while punching down the caps. Another historic winery in the heart of the Napa Valley, Louis Martini, also fermented its award-winning red in concrete vats well into the 1990s. I always found the reds — especially the Cabernets from Monte Rosso — to be more old-world in style, more balanced, more rounded and with less alcohol than Martini’s Napa neighbors. Perhaps because of the concrete vats? Concrete, in an improved shape, is making a comeback in the wine industry. Concrete in the shape of an egg has an inside surface with tiny pockets of air that refill each time the tank is emptied. These smidgens of oxygen enhance aromatics, tame tannins and increase mouthfeel. Unlike oak, it’s neutral, easy to maintain and more affordable. 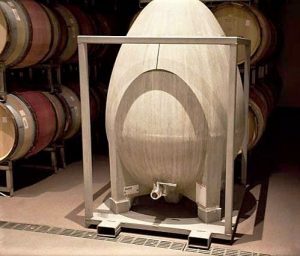 While touring and tasting at Force Majuere in Woodinville, I first glimpsed the egg-shaped contraption, brought north by former California winemaker Todd Alexander. There is a considerable difference in the wines that spend time in concrete. Some winemakers believe the thick concrete walls guard against abrupt temperature swings, keeping the fermenting wines naturally cool — a distinct advantage for some warmer climes of the world. Cool and constant temperatures are always beneficial for wine. Take the 75 bottles of Veuve Cliquot Champagne, for example, still sparkling and youthful after spending 170 years in the cellar of the shipwrecked Titanic submerged in the Atlantic Ocean. Balance is the brass ring that winemakers strive for when producing a wine for the cellar. Another factor that influences the taste of your wine and whether it will age gracefully would be the method of closure. There is nothing like the transformation that occurs at the sound of a cork popping. There are few other sounds in the world quite the same. Pop announces the party. But cork has had its problems and because of those problems, alternatives to cork have emerged that don’t quite have the proper party announcement. Plastic corks, glass stoppers and screwcaps all influence your wine in their own inimitable way. Still, cork is the most common seal for wine bottles, accounting for 70 percent of all wine stoppers in the world. It was used on 95 percent of wines produced at its peak in the 1990s. And 93 percent of consumers say natural cork signifies a quality wine. More than 12 billion cork stoppers are produced each year, mainly from cork forests in Portugal and Spain. The downfall of the cork in the late 20th century was the excessive cork taint in 10-20 percent of wines produced. Caused by trichloroanisole (or TCA), cork taint will make your wine smell moldy or like wet cardboard, and the taste is just plain flat. Not something you want to happen to that special bottle you’ve been saving for that very special occasion. To protect their wines from TCA, some winemakers started using plastic corks on their bottling lines. They’re resistant to TCA but their downfall is fit. Unlike cork they can’t adapt their size in the neck of the bottle and the result is an imperfect fit. A loose fit can let in too much air and then you have an oxidized special occasion wine, flat tasting but without the moldy aroma. And then there is the ubiquitous screw cap. Their advantages are twofold. Screw caps maintain a tight seal, so oxidation is eliminated. And they’re mighty convenient. Just a simple twist, craaaccck and pour! Whether your wine is sealed with cork, plastic or a screw cap will determine whether you want to cellar it or drink it near term. Cork is still the best and most favored closure for cellaring, and TCA, while not eliminated, has been significantly controlled. Plastic is wrong on many fronts, and screw caps are the best for wines consumed within a year of bottling. And now, finally to Italy for a wine fiasco. Around the 1500s, bottles were slowly replacing wooden kegs. They were, of course, mouth-blown glass and were more balloon shape than Bordeaux shape. These balloon-shaped bottles were round, so rolling around is what they did naturally whether on the supper table or in an ox cart on the way to market.